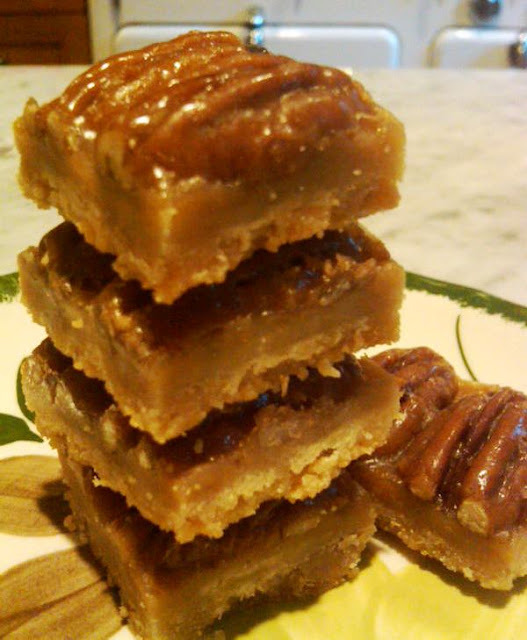 These Creole Pecan Praline Bars are addicting, delicious and, while I didn't find the recipe on a hand-written vintage card, are from a very old New Orleans recipe, according to Maida Heatter, a fabulous pastry chef and cookbook author, and whose recipe I've adapted here. While not strictly a Christmas treat, these beauties look lovely nestled in a tin filled with cookies, candies and other holiday sweets. They're easy (if tedious) to prepare and are an simple way to impress friends, family and gain weight. 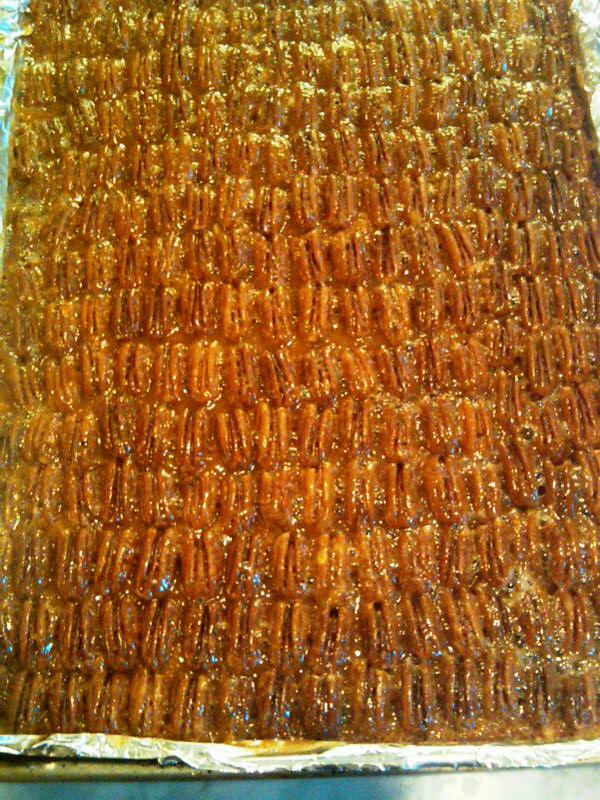 I used to make a big tray of these every week for a local cafe, and I must warn that placing individual pecans precisely on the expanse of bottom crust can conjure up images of The Yellow Wallpaper. Call a friend or listen to NPR while doing this task; your mental health will thank you. Right out of the oven, the tray is a field of pecans and sugar. Preheat oven to 350. Line a half sheet pan (app. 13 x 17) with aluminum foil, with some extending beyond all edges. Beat butter til soft in an electric mixer. Add salt and sugar, beat. Add flour and beat for a minute or so until the ingredients form tiny crumbs that will held together when pressed between your fingers. Next, place the pecans halves on the crust, flat side down, all in the same direction. Put both ingredients in a saucepan with an 8-cup capacity, and stir over high heat with a wooden spatula until the mixture comes to a hard boil all over the surface. Continue to stir over the heat for 30 seconds. 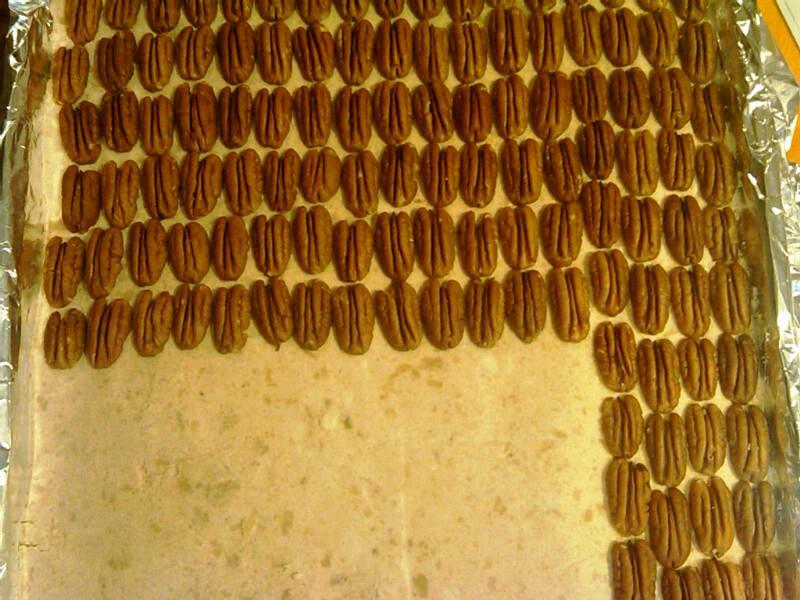 Remove from heat and pour the hot mixture all over the pecans, trying to coat the entire surface. Remove from oven, let cool and then refrigerate until cold. Lift the bars from the sheet pan and lay on a flat surface to cut. Enjoy. Watch the pounds creep on, they're that good. You can cut them into mini squares or make them larger. Denise: And my husband said that no one would get the Yellow Wallpaper reference!! And do make these; you won't be disappointed. Thanks so much for the comment. how funny -- I have this book in my backpack! They were giving out free copies at the library today. I just made these gems last night. They are intense with flavor and texture, not to mention attractive, being all orderly and glistening! A great addition to the cookie tray. Thank you. I am a little confused about when/how to cut. I am supposed to let the entire sheet cool in the fridge, then remove it to cut? How well does it cut when it is cold? Yes, chill in the fridge and then cut. If you have a good chef's knife (not serrated) they cut well. May need a bit of pressure, but pretty easy to cut. I've been following and enjoying your blog for some time and have made quite a few of the treats, all of which my family enjoys as something different and unique. 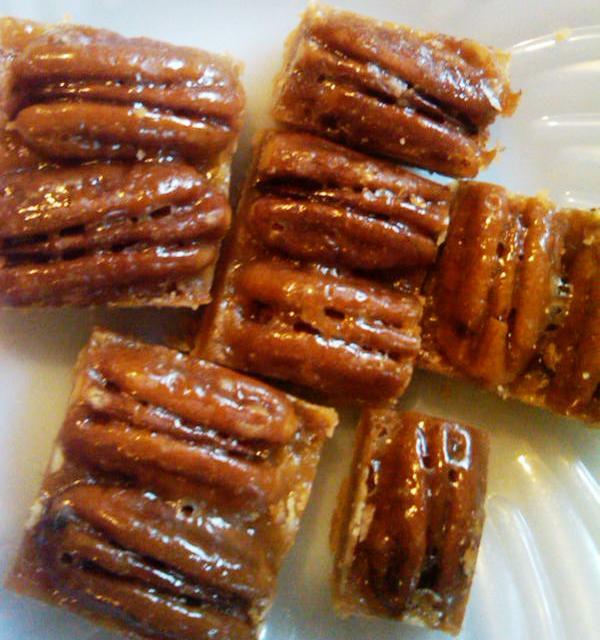 These praline bars, however, were the most favorite of all - SO FAR! They were easy to prepare (with ingredients I happened to have on-hand) and really hit the spot. If we gained any weight from eating the entire pan in a few days, it was worth every single calorie. I will definitely be making them again in the future! Thank you for sharing!